My adventure touring gear arrived in the mail yesterday. Naturally, I couldn't resist putting it on this morning and riding the bike to work. I was only wearing jeans and a T-shirt under it, but I felt much warmer than when I wear heavy clothing under my other riding gear. If anything, I sometimes felt too warm in it, as I'd left the quilted liners in and didn't open the vents. It was only about 55 degrees F out today, but it should still work in colder weather if I add a scarf or neck warmer and wear some warmer things under it. Motorcyclists often call gear like what I wore today their "Power Ranger gear." With my full face helmet and a red and black riding outfit, I'll have to admit that I do look sort of like one of the characters from the TV show. Or is it that Power Rangers look like motorcyclists? Both sorts of gear cover the whole body, fit rather tightly, include a helmet to cover the face, frequently use leather, have brightly colored patterns, and look, well, a bit more sci-fi than normal casual attire. But the motorcycle gear came before the show. Could it be that the Power Rangers are trying to look like they ride motorcycles? Or maybe it's that the Power Ranger suits simply need to be similar to motorcycle gear because they happen to have similar needs. Why do the Power Rangers wear Power Ranger suits, anyway? It doesn't seem that the suits give them their powers, so presumably the suits are there to help them fight whatever the show's villain is. One rule of superheros is that the bad guy always has some way to get the best of them when they first meet. Otherwise, the story would never be very interesting. Since for a Power Ranger, this can easily mean getting thrown all over the set, it's likely they need to be protected from falls and road rash even more than motorcyclists need that protection. So a leather costume and a full faced helmet really make sense if you're in the superhero business. That would explain a lot of the similarities. If I ever wrote a movie about a superhero, I could probably do worse than having him pick out his superhero costume from a motorcycle shop. But there is one thing I'm a bit puzzled about with the Power Rangers. I wear a brightly colored suit so that other drivers will notice me. But why do the Power Rangers wear bright colors, with each of them having a different color? I can't quite figure out that one. Maybe their base on the moon happened to be near an outer space motorcycle dealership that didn't have very much in stock. That was not a pleasant surprise. Last night, I bled the brakes in the Nissan. They're working a lot better now, but when I was driving to work, I had this strange, nagging feeling. Like maybe I'd forgotten to put the cap back on the brake fluid reservoir. I tried to ignore the feeling, but it kept growing on me. So I pulled over into a parking lot and popped the hood. I couldn't believe what I saw. A large rat stared back at me from its perch on the intake manifold. The rat looked almost as surprised as I was. 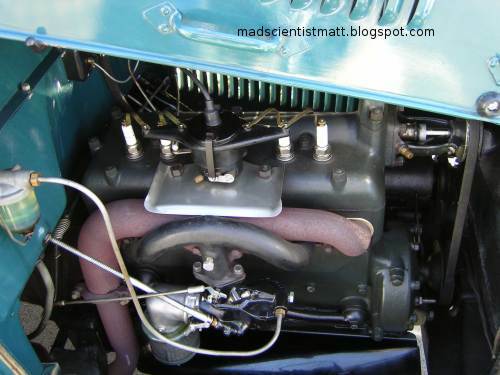 It scampered between the engine block and the firewall, and disappeared. I think it must have jumped out of the engine compartment and ran off, but sometimes it's hard to tell. So I'm going to put some poison or traps in the garage to make sure it's gone. I took the GS out for a ride today, and also took a few pictures. Fixing the lower control arm with the torn bushing did stop the shaking, after all. There does seem to be a few traces of the problem remaining - for example, it seems to pull to one side under power. It may be that there's another torn bushing down there that I didn't replace. Or it may be that the bushings are so soft anyway that the rear suspension always has trouble locating the rear axle. Hard to say... but at least the problem's been downgraded from scary to mildly annoying. Looks like the CX500 may have to go. My wife and I had a talk about whether it really was a good idea to make a 40 mile commute, each way, on my bike. We concluded it wasn't. After all, the CX500 has given me a fair amount of trouble, and would need a lot of work to make it into anything other than a ratbike. And a newer bike isn't that expensive. 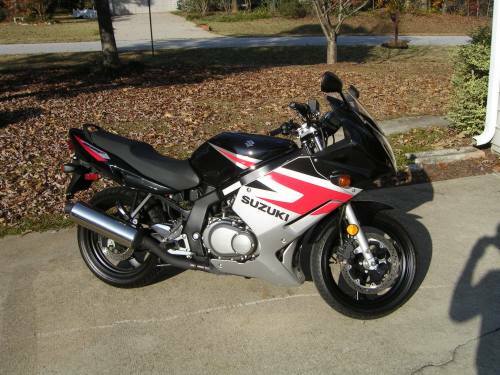 So, today I went out and bought a Suzuki GS500F from ValuCycle, a used motorcycle dealer in Conyers, and rode the bike home. This new bike looks sort of like a GSXR, although it's not quite as powerful (or expensive), and it has an air-cooled two cylinder engine. This one had less than 1,400 miles on it... which is less than half the miles I've racked up on the CX500. Overall, it looks like this bike ought to work out pretty well. It's in almost brand new condition. On a good day, the CX500 may have a shade more power, but then again, on some of the CX's bad days, it's made considerably less. 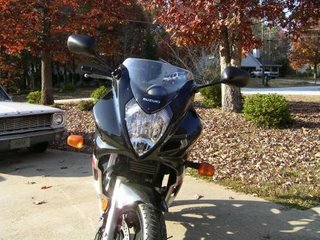 And the Suzuki handles and stops much, much better. Comfort seems about equal between the two. I'll be putting the CX500 up for sale soon... and I should have pictures of the "new" bike up tomorrow. Not sure if I found the whole problem with the Nissan's rear suspension, but I sure found a big part of it. Today I pulled off the right lower control arm, which hadn't felt right when I had the axle apart, and found it had rips in the front bushing about three quarters of an inch long, extending all the way through it. I replaced it with one of the control arms that came off the junkyard axle. We'll see if that fixes the shaking. 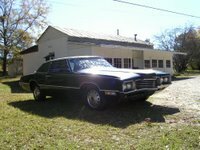 My wife spotted this '71 Thunderbird for sale recently, and we decided to take a look at it. 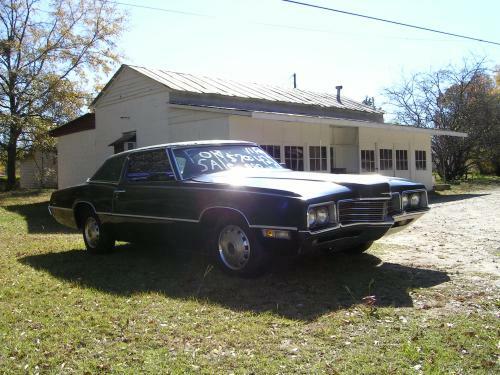 The owner was asking $700 for it, which is probably a reasonable price given its condition. It has a 429 that I was able to crank up from a cold start, and most of the mechanical bits are in working order except for a couple fluid leaks and some issues with the power steering. The bodywork also needs some attention. It used to have a vinyl top and there are a lot of rust holes that formed under it, and there's some rust in the trunk area too. Some emblems are gone. And there's a rip in the upholstery. But overall, it's in better condition than my Dart was when I got it. However, it looks like my wife was hoping for something that needed a little less work. And I thought the Nissan had given me a bad day last week. Sometimes something shows up on the Internet that makes me count my blessings even after a hard day wrenching. Given how much work I've done to the Dart, on the occasions when I need to drop it off for someone else to take care of something, I often need to warn the mechanics about how it won't match the usual specs. 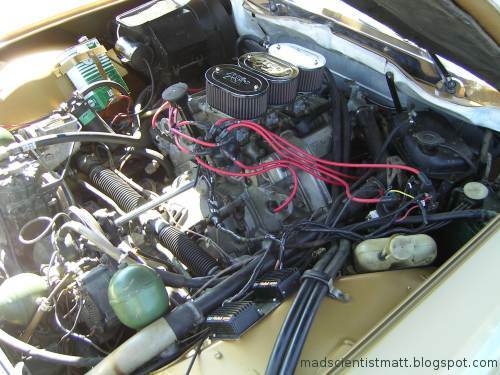 For example, when I took it to Goodyear, I warned the mechanic that while a '66 Dart should have reverse threaded lugnuts on the driver's side, this one doesn't. (And if it were stock, I'd probably want to warn the mechanics about the reverse threading.) And if I ever decided to take it to a brake shop for a routine brake job instead of doing that myself, I'd probably have to spend ten minutes explaining the origin of the brakes on the car, since the correct parts for a stock '66 Dart are definitely not the right ones to use on mine. Well, it seems that a Lotus Elise is one of those cars that requires a few special instructions - even more than my Dart, it seems. An Elise owner who goes by the nom de net of qball dropped his Lotus off at a Goodyear tire shop to have some new tires put on, and the mechanics, well dropped it off too. It seems they're rather tricky to balance on a lift. The owner posted this thread and a collection of pictures to document the disaster. Now it's been declared a total loss. Jerry (the boss at DIY Autotune) paid for me to take the classes from EFI University as part of my training for my new job. I took both the 101 and Advanced courses. Both classes took place at Forged Performance in Marietta. They're an import performance shop which specializes in Nissan Z-cars, although they had quite a few other things sitting around their shop, including an Eclipse with a turbo 420A, a stock looking Infiniti with a Vortech blower, and a sleeper Subaru. 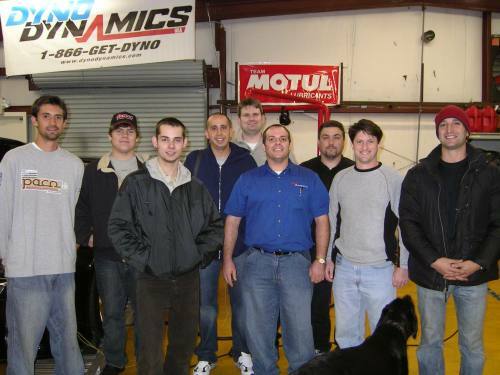 The shop owner, Sharif Abdelbaset (on the right in this picture, with the red hat), has an absolutely evil looking twin turbo 350Z that we used as a test mule in the Advanced class. When not detuned to keep careless trainees from breaking it, this Z car can post more than 560 hp on the shop's dyno. Which Sharif was happy to demonstrate after the class was over. The 101 class starts with a day that's primarily review if you've studied the MegaManual or read up on how fuel injection works. The EFI University curiculum does take a one size fits all approach, which is handy for someone who walks into the class with no knowledge of EFI but is a bit slow of an opening for those who are more experienced. Still, I did pick up a few interesting pointers I hadn't known in the overview. After explaining how EFI works, the next section of the 101 class covers basic tuning principles. 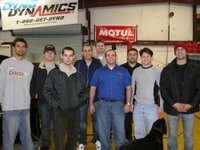 There's a lot they cover there, and the instructor who taught the course, Chris Macellero, has years of experience at dyno tuning. The most eye-opening part of the 101 class, though, comes at the end of day two, when the instructor puts a car on a dyno and demonstrates some of the tuning principles, showing the effects of changing air/fuel ratios and spark timing. The 101 class is mostly lecturing and demonstrations; not very hands-on. In the Advanced class, though, the students get to drive a car (in this case, Sharif's black Z) on the dyno and practice changing the settings. It starts out with the basics (seeing how it feels to drive the car on rollers instead of the road) and ends with a series of full throttle dyno pulls. Chris had deliverately sabotaged the Z's tuning for the class to give us a lot to straighten out, always erring on the side of not breaking things, of course. I definitely picked up a lot of useful dyno tuning tips there, which is the biggest focus of the EFI University classes. The classes are not as much about installation or design as about dyno tuning adjustable EFI systems. 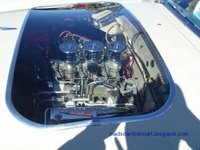 It seemed the members of the 101 class were about evenly split between shop owners and enthusiasts, while the Advanced class was mostly people who were in the tuning business or looking to get into it. I had suspected the right coil on the CX500 wasn't delivering enough juice when it was hot. I poked around on the CX500 forums and a few bike shops, and found that there didn't seem to be many alternatives to the Honda coils ($80-$90) except even more expensive aftermarket coils. Well, I figured the CX500 has a capacitive discharge ignition, most automotive performance ignitions are capacitive discharge as well, and a high performance automotive coil doesn't cost ninety bucks. Also, in a baka moment, some Honda engineer thought it would be a good idea to make the spark plug wire an integral part of the coil. I'd much rather have a wire I can replace if it goes bad without replacing the entire coil. So I made up my mind to try out a MSD High Vibration coil on the CX500. Started work installing it today. Mounting it was a challenge - it's about twice as big as the CX500 coil, and I wanted it tucked under the fuel tank in a more or less stock location. But eventually I fabricated a bracket that ought to work. Then I went to make the plug wire. I checked it with an ohmmeter, and its resistance looked way too high. So I took a look at the wire and at the spark plug cap. The plug cap's resistance was around 17 megaohms! I'm surprised the ignition could even fire. I pulled the cap on the other side, and its resistance was much lower. Looks like I found the problem. Luckily, as I didn't feel too good about installing a new wire but leaving the old cruddy plug cap in place, I've got a new pair of those on order. So was this coil switch a fiasco? Not really. When I'd done my research, I found that it seemed nobody knew if it was possible to run an MSD Blaster coil on a CX500. And I doubt Honda has built any new CX500 coils for over a decade. So it'll be worth it as an experiment to see if I can come up with a new source of coils for the CX500 community... or a warning about something they shouldn't try. And if it doesn't work, well, at least I'll have a pretty hot coil that I can put on the Dart if I ever want to try an MSD ignition on it. Well, I got the axle back into the Pathfinder and took it out for a test drive. The shaking problem seemed a little better - but not completely gone. And I need to do a better job of bleeding the brakes - there's still air in the lines. Not good. Right now it's worse than before. Mental note: "One man brake bleeders" aren't. Except Speedbleeders, but I can't find a set that fits the Pathfinder's rear wheels. There is a bright spot: I spotted some suspect bushings while I was removing the axle. Unfortunately, I didn't have time to change them out. As a test, I'm filling some of the bushings on one of the junkyard control arms with caulk. Once that dries, I'll swap it out and see what it does about the shaking. It's 8:20 PM. Do you know where your rear axle is? When I got home from work today, I decided it was finally time to yank the rear axle out of the Nissan and get the replacement piece swapped in. I started by disconnecting the parking brake, ABS sensors, anti-roll bar, brake line, and driveshaft. 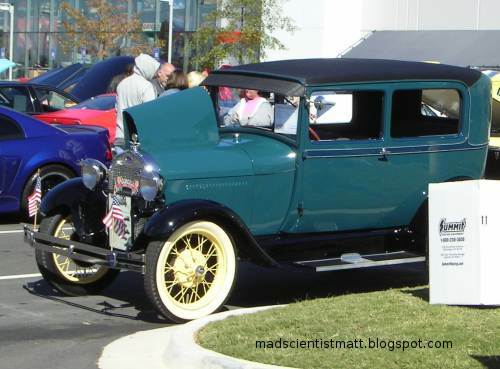 When I got to the last item in that list, I found that Nissan had devised an especially fiendish way to attach the driveshaft to the axle: They had used a flat flange held on with four bolts, with enough room for a box wrench on either side. There's no way to fit a convetional socket wrench on either end. So that pretty much rules out the usual high torque tools a home mechanic might use like a breaker bar. There's certainly no way I can see to get an impact wrench in there. I wonder just what sort of tool Nissan's engineers expected their mechanics to use when removing a driveshaft that's had years of road grime to rust the bolts in place. Perhaps Nissan dealerships have a chest of meter-long box wrenches. I finally removed the nuts by putting a box wrench on them and smacking the wrench with a 4 lb sledgehammer. It looks like that's about the only way to get these removed, other than slicing through the bolts with an angle grinder. So I had the rear axle out... at about 8:20. Didn't leave myself much time to put it back in. After a determined struggle, I managed to get the axle in place, but did not have time to finish getting all the brake hardware back on. Looks like I'll be taking the bike to work tomorrow. They're predicting rain. My friend Jay invited me to come see the car show at Summit Racing yesterday. 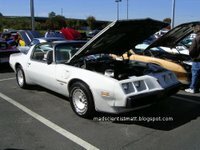 As it was a Camaro and Firebird show, I decided against bringing the Dart, but when I got there, I found I definitely wouldn't have been the only entrant without an F-body. Here are some pictures I took. 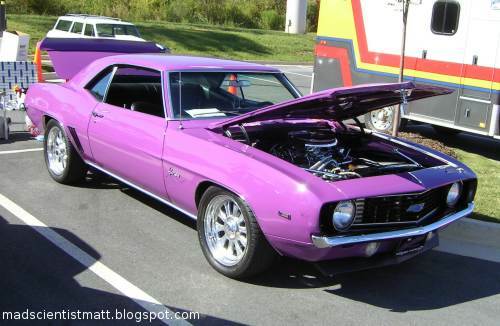 Since it's an F-body show, I'll lead off with a picture of a first generation Camaro with a very shiny and very purple paint job. Check out its pinstriping. 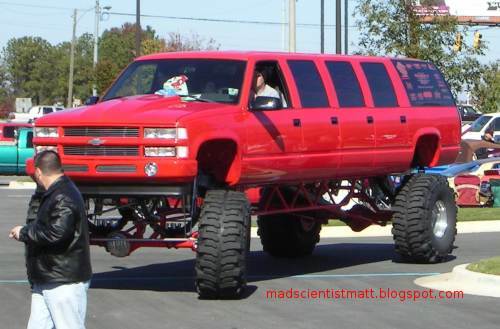 And I like the choice of wheels, too - large without being overdone. A Chevy coupe parked next to a '50 Ford... only the '50 Ford is not a 1950 at all, but a kit car based on a late model Thunderbird. 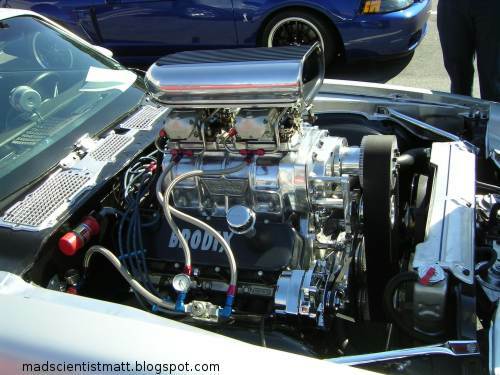 Don't want to pop the hood to show off your old school Ford V8? Plastic windows to the rescue! 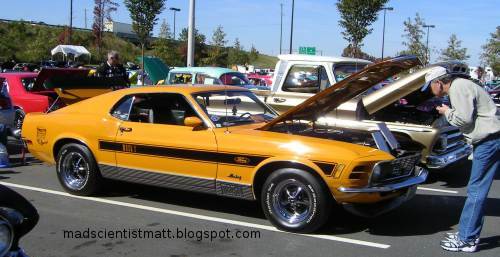 Various cars that showed up, including a one of 96 1970 Mustang Twister (Yes, the Twister name appeared on Mustangs as well as Dusters! It was a rare option only sold in Kansas.) 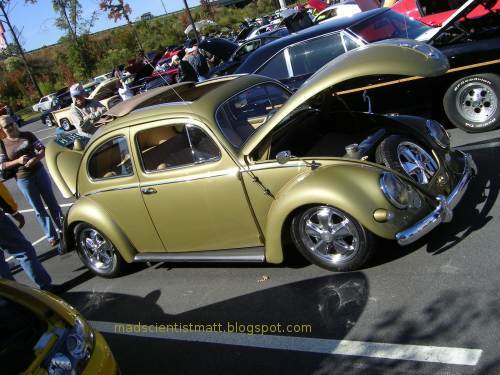 and a 1957 oval-window Volkswagen with some very shiny Porsche alloy wheels. 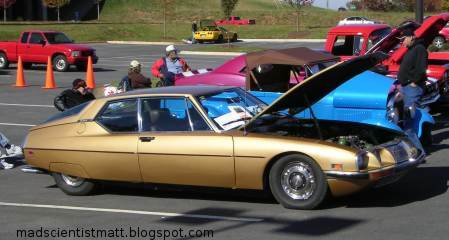 You don't see too many French cars at a typical American cruise-in, but somebody brought a Citroen SM. Note the backwards-mounted Maseratti V6 engine under the hood, and all the gear needed to drive the hydropneumatic suspension. 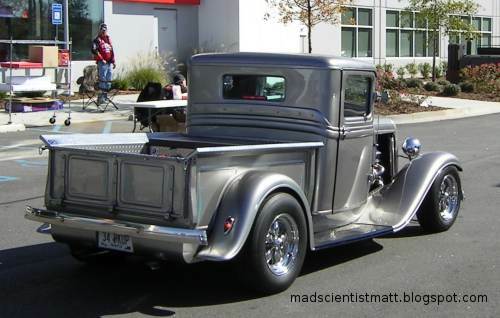 The only prewar Ford at the show not to have a Chevy V8 under the hood. Check out the spark plug "wires" on that flathead four. They're just strips of bare copper sheet metal. I'm pretty sure that's the original design. Scary, isn't it? Pro Street lives on. There were two Camaros there with massive blowers and huge rear tires. 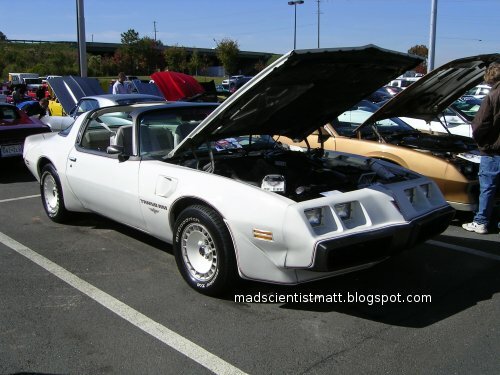 Here's a very clean and well kept Turbo Trans Am to finish this mini gallery. I've been pretty busy recently, between work and trying to get the Nissan's axle swapped in. I've finished repairing the brakes on the Nissan's replacement axle and got the bolts that hold it in place turning freely, so I should be able to swap that axle in once I get a good block of time to do it. I will be very relieved when that's done. Working on a car you don't need to drive is a hobby, but fixing a car you need to use is an obligation. And obligations aren't nearly as enjoyable as hobbies. After taking the Dart out road tuning recently, I noticed a puddle forming under the front end. The puddle was beige and frothy, like it was leaking the foam off a mug of Guinness. As the color didn't quite match any fluid that is supposed to be in the car, and I know I didn't fill any of the reservoirs under the hood with Irish stout, I found that a bit worrisome. 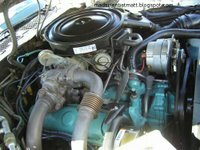 The nature of the problem became clear when I popped the hood: What I was seeing was rusty coolant leaking from a pinhole leak in the radiator neck. The radiator is one I had pulled from a junkyard Aspen years ago and it had given me problems in the past, which I had patched with JB-Kwik epoxy. While it did cross my mind to try more epoxy or maybe a little silicone sealant (I didn't consider Alumiseal or Bars Leak type things to be an option; in my experience those can let go after a couple years), I've decided that I will fix it right. 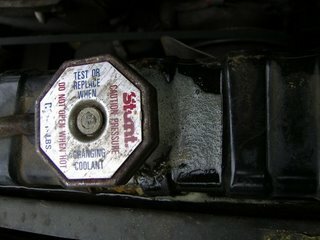 So my plan is first to give the cooling system a good flush to remove any rust and other crud. Then I'm yanking the junkyard radiator and dropping in an aftermarket aluminum radiator. 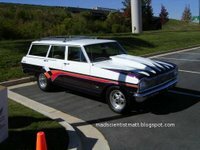 I was at Summit Racing's McDonough store for a car show yesterday (pictures will be up very soon), so while I was there, I stopped in and bought a Griffin circle track radiator. Since the Dart has an automatic, I also bought an external transmission cooler. Unfortunately, they didn't have the brackets I need to install the radiator on hand, so I'll have to wait for those to arrive. And when I put the radiator in, I'm also planning to put in an intercooler. As soon as I get that done, I'll be off to dyno test it and get everything dialed in. Stay tuned.